CSKA Moscow came from three goals down in the first half to beat Mordovya 6 - 4 in the Russian Premier League on Sunday afternoon at the Stadion Start. Five minutes out of intermission, Panchenko pulled a goal back for the visitors before Tosic reduced the deficit eight minutes later and Seydou Doumbia tied the game in the 59th minute after Ahmed Musa provided the assist. 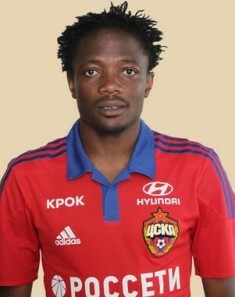 After Mordovya went in front again, Ahmed Musa drew his team level in the 80th minute and he gave the Muscovites the lead for the first time in the game five minutes later. The Nigeria international has now netted 34 goals in the Russian Premier League since his switch from VVV Venlo in January 2012. The Army Men, who top the table with 25 points, will host city rivals Lokomotiv Moscow next Saturday.